What is an Artist Résumé? "The artist resume provides a selected overview of your artistic and professional accomplishments, education, affiliations, and hints at future aspirations. It usually accompanies your artist statement for exhibitions, proposals, and portfolios." The artist résumé is the 'short version' of your CV - an abbreviated document that is used in conjunction with commercial galleries, the search for exhibition opportunities, and certain grant applications. REMEMBER - This is about you life as an artist - not every job you've ever had! From a gallery perspective, if a resume is to be used in a catalogue then it needs to be accessible, informative but succinct. If you are using a resume to try and become a gallery artists, then it needs to be long enough to contain enough relevant information which will accredit your status, experience and achievements. The College Art Association suggests that it is typically one to four pages in length. Professional / Curatorial Activities - what you do besides create art! 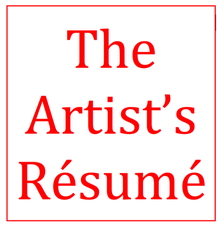 WRITING AN ARTIST RESUME By Margaret (Maggie) Brezden An artist resume is an absolute necessity for every professional artist. Although an artist bio may contain similar information it is presented in a different format than the artist resume. Being an artist means not only making your art but of course promoting your art. But some would argue that you're really promoting yourself. Regardless, you need to have a good resume. How to Write a CV Resume for an Artist. The main difference between a CV and a standard résumé is that the CV is much longer and more detailed. Standard résumé are typically no longer than one page, while CVs can be many pages long. Regular contributor Karen Atkinson gives advice on résumé creation. An artist resume is different from a regular employment/work resume. A resume is valuable for applying for a grant, residency, art gallery show, and more. It may also be attached to an art portfolio, and on your art website. Careful with juried shows. They're a good thing early in your career when you're building your resume and looking for exposure.... By midcareer, however, you should be off and running in academic galleries, libraries, co-ops, non-profits and, ideally, in commercial galleries. Here are suggested categories for a resume for an artist or maker. Work on your resume so that it is ready at a moments notice. This post includes suggested categories and the information that fits in each category. Professional advice, information, and the Professional Guidelines for artists, makers, and crafts community by Harriete Estel Berman. Work on your resume. That sounds so simple, but it takes some time and repeated reviews. Ask your friends and parents to proof read and critique each edit. Improve, edit, improve, edit, improve. This is true for seasoned professionals,too. 1) Start a file labelled "Resume." Alyson B. Stanfield - "What? No resume?" Listen in on this week's podcast-an audio version of the Art Marketing Action newsletter-"Keep a Master Resume"
If you're using Microsoft Word to create your resume and are finding your columns out of line, I suggest using the Tables feature. Are you confused about the difference between your artist biography and artist statement? I'm here to help! It's much easier to record exhibition records as you go along rather than waiting for some point in the future when you might have to dig through files or boxes. Memories fade rather quickly. Do NOT forget to think about what an art gallery or art dealer WANT TO KNOW rather than what you would like to tell! The fact that something exists in your background isn't a good reason for including it in your CV. Assume your prospective gallery or dealer is a busy person and make sure your resume answers all the key questions. Lean towards "less is more". Providing people with too much information can mean they just skim and give up. Providing your name on your artist resume is deceptively straight-forward. I describe it that way because some artists make the mistake of using aliases. You DON'T want to use an alias when submitting this information. You need to think outside of the box when deciding on what information to provide on your artist resume. Furthermore, you need to think about the implications of that information beyond the paper. Some art dealers will request that you include a short biography within the context of your artist resume. The Artist Residencies heading can be extremely deceptive if you are not sure what exactly the heading should detail. The following advice will give you an idea of what is expected from art dealers. This is part two of a four part series by Don Friedlich, Harriete Estel Berman and Andy Cooperman for artists and crafts people about submitting work to galleries and retail establishments. Originally published on Etsy's Storque. Find CV Advice and other CVs & Applications articles. Get your job advice from the career experts at Monster. Find Free CV Templates and other CVs & Applications articles. Get your job advice from the career experts at Monster. Who are you on the web? How do you describe yourself? What words do you use to tell the world who you are, what you stand for or represent, what you do, how you do it, and why they should want to get to know you and work with you? I’m referring to the words that show me a lack of effort, leadership or confidence – and make me want to disqualify the applicant from consideration whenever I see them. Sample Bios - which are actually Sample Resumes! Peter Doig's Resume - described as a Biography by his gallery!